Unearthed, a South African documentary about fracking (not to be confused with a 2007 horror movie of the same title) is showing at the 2015 National Arts Festival in Grahamstown. I saw it at 10:00 am Tuesday 7 July; I recommend trying to catch it if you missed the first showing. I have seen a fair amount of material about fracking, attended protests, and so on. And one thing always strikes me. Fracking has a bad name. Literally. The word sounds threatening and vaguely obscene. Apologists protest that fracking – hydraulic fracturing to give it its full name – can’t be that harmful because breaking up rock a few kilometres below ground can’t be that harmful. Groundwater after all is at most a few tens of metres below ground. This movie goes on a journey not to dissimilar to my own – the pro arguments are carefully presented, then carefully dismantled. Yes, world energy demand is escalating. But promises of massive gas yields from shale gas have proved illusory. In one scene, the promise of jobs is neatly demolished. A women has been working a few weeks, and expects to be out of work again by September. The date of the scene isn’t given, but the job clearly could not have gone on more than 9 months. politicians and industry sources claim there is not a single documented link between fracking and harmful consequences – this claim is laid bare for the dishonesty behind it. For one thing, the victims for whom consequences could be documented are routinely paid off in exchange for non-disclosure. For another, “fracking” narrowly defined is just the deep underground fracturing of rock, not the whole process of drilling, casing the shaft and operating the well – all of which are much more hazardous than fracking per se. There is a lot more than this – parts touch on climate change, and we see numerous health effects of the by-products of fracked wells. If you really want to understand the fracking debate, see this movie. Jolynn Minnaar: you have done a far better job than Josh Fox’s Gasland. I hope this movie is widely seen. And we put a stop to this before it wrecks the Karoo. As a service to the community I occasionally post links here to documents the Makana municipality should make available but lacks capacity to post to their own web site and also any other information of interest to Makana Civil Society Coalition (like on Facebook to keep up) members and supporters. – inspired by poetry reading for rhinos and elephants, Grahamstown, 4 October 2014, on the occasion of the Global March for Elephants and Rhinos. Every now and then I still run into the argument that climate science is far from settled, that we cannot rely on the fact that the vast majority of scientists in the field are in fundamental agreement and that “real” science requires proof. Models, people taking this view, are imperfect, and not “real” science, which is not a popularity poll. Let’s examine how science actually works. First, what is a model? It is an abstraction of reality that allows you to make predictions. A good model will make accurate predictions; a useful model makes predictions accurate enough to allow reasonable action ahead of knowing the correct result. Weather models, for example, are not 100% accurate, but good enough to allow us to do things like plan whether to do laundry, or to evacuate a city ahead of a major storm. We need two things of model predictions to be sure it is useful. We need error bounds and evidence that those error bounds are accurate. Error bounds are a measure of how much our model varies from reality. If the error bounds are too big, any model predictions may be no better than guesses. If the bounds are not accurate, we do not know how much confidence to put in the accuracy of any prediction. Nothing in science is ever proved except in pure mathematics. Take an example: Newton’s Laws of Motion and his theory gravity. These all look nice and mathematical, but they ultimately rest on matching prediction to models. Those models are relatively simple – a bunch of 1-line formulae, but these formulae result from observations, not mathematical proofs. Take gravity, for example. Newton came up with a formula, then used that formula to calculate movement of planets and found it matched. Newton’s formulae are models. They are an abstraction of an aspect of the universe that can be used to predict outcomes including many Newton would never have though of – whether a space probe reaches Jupiter, whether a car stops in a certain distance when you hit the brakes, and so on. Since his time, millions of measurements have fitted his models so well, they have become accepted as correct – mostly. Late in the 19th century, the puzzling problem that the speed of light did not vary according to the relative speed of the source and the observer arose. Only with Einstein’s intuition that an invariant speed of light required rewriting Newton’s Laws did we solve this conundrum. Even so, Newton’s formulae still work well enough in most situations that we still use them. Models of complex real-world systems cannot provide the accuracy that Newton’s Laws do. Nonetheless they can be useful – even if the results have significant unknowns as well as known sources of error. How do we determine if a model is sufficiently accurate to be useful? By taking lots of measurements. If the model consistently gives answers close enough to reality that we are confident that the accuracy we predict for the model is correct (the difference from prediction is within accepted error limits), our confidence in the model grows. That is how consensus in science works. Einstein’s theories, for example, were not fully accepted, despite their mathematical logic, until they could be verified by measurement. On the other hand, it only takes one measurement that completely contradicts a theory to call it into question. Staying with Einstein and Newton, the starting point was the Michelson–Morley experiment, first published in 1887, which demonstrated that the speed of light is a constant. This was followed by the Lorentz transformations, developed over 1887 to 1905, which became the basis for Einstein’s special relativity. Despite these radical changes, Newton’s Laws still apply because a Einstein’s new theories come out with the same numbers in most cases where we are not dealing with speeds close to light speed, or gravitation on a relatively small scale. So despite Einstein’s radical new theories, Newton’s theories still stand – even if we now know they are not totally accurate. Climate science is not a simple collection of formulae but is based on complex models that are hard to understand a piece at a time. Even so, the same basic concept applies. If you can make predictions that, when later tested against reality, are within the predicted error bounds, you can make claims about the accuracy and usefulness of the theory. Some have made a big deal of the relatively slow rate of global temperature increase since the late 1990s. The models do not claim that all temperature variation is human-caused. A major factor is solar variation. Another factor is inaccuracy of models of how the oceans take up increased energy. In the first half of the twentieth century, the sun was on a slow warming trend, which made it hard to pick out the effect of anthropogenic global warming (AGW: human-caused warming). The most recent solar cycle, on the other hand, has been relatively cool. That alone is a big factor in the apparent slowdown in warming, and is not a factor we can rely on because either the sun will return to its long-term relative warmth, or the AGW trend will rise sufficiently to mask this effect. The oceans absorb 90% of any change in the planet’s energy balance in the short term, because a temperature change in water can be mixed into lower layers, since water is constantly in motion. A small perturbation in the way the oceans take up heat can have a huge effect on surface temperature. There is increasing evidence that the oceans are warming a little faster than predicted, and that effect too can explain an apparent slowdown in surface warming. 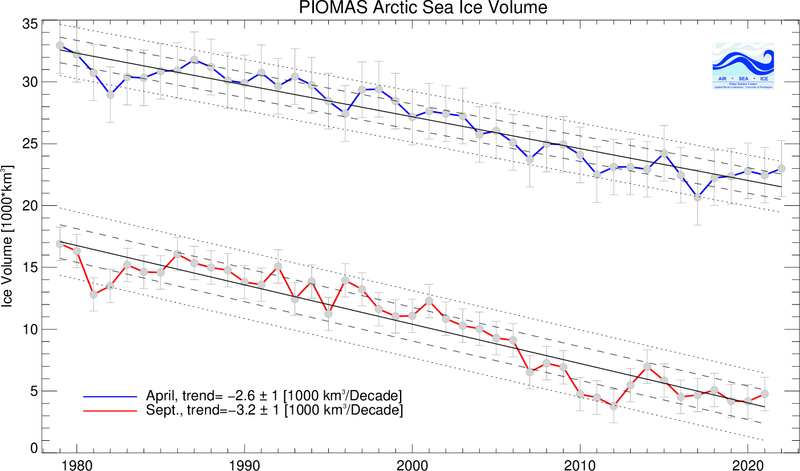 Arctic sea ice volume trend (April and September). There is plenty of evidence that the Earth is not in balance with energy flows in from the sun, such as growing ice loss both on land and Arctic sea ice, and that energy imbalance can only ultimately be corrected by a higher surface temperature. And finally, the apparent slowdown is within the error limits of the commonly accepted models though at the lower end of the predicted range. Other published predictions that have held up well include predictions of extreme weather in the US, and that is the sort of prediction we need to worry about. So the argument that the models are fundamentally flawed is wrong: they are not totally accurate, but they are accurate enough to be useful. Grahamstown has an historic railway station, built over 140 years ago. Train service to the town stopped a while back but the building was in use as recently as 2011, but is now in an advanced state of stripping by vandals. The station in 2013. It is worse now. Grahamstown Residents’ Association (GRA) has launched a campaign to save the station, starting with a petition targeting the owners, Transnet, who have an obligation in law to maintain a heritage building, as well as all levels of government. Update: you can find GRA on Facebook. Please visit and like. In the long term, ideally, we should get train service back. In he meantime, the building could be a great community resource. If Transnet doesn’t want it, it could be transferred to a community organization to renovate, secure and maintain. In a town with so much unemployment, allowing a valuable resource like this go to ruin is a terrible waste – and we want out trains back. Please support this campaign by sharing on Facebook, twitter, mailing lists – and any other way you can spread the word. If you can’t get to any of these, you can instead fill in the electronic version of the petition. Real signatures probably count for more, but all signatures add up. The petition closes 12 September 2014, so please do not delay, and spread this around to your contacts. I also encourage you if you live in Grahamstown to join GRA. At R10 per year, it is affordable and we need weight of numbers for campaigns like this – especially as the town has been placed under administration. Click here for a form. Here is a panel discussion on abandoned buildings, hosted by Rhodes journalism students, published by Grocott’s. The station figures prominently. As of 19:00 5 September, we have about 1500 signatures from all around the country as well as from around the world. Countries include UK, Netherlands, Australia, New Zealand, Botswana, Thailand, Japan, Egypt, Brazil, UAE, USA, Spain and Zimbabwe. As of 3 October, with most signatures in (note that the online form is no longer available but you can add comments at the bottom of this page) we have 3334 signatures). As a former resident of Grahamstown and DSG Old Girl, I strongly suggest that you alert the Rhodes University alumni office and all similar networks for past pupils of the local independent schools to this petition, as I am sure that there are thousands of former users of this iconic building who would love to see it preserved for posterity. As a heritage site and an important part of South Africa's history, neglect by the owners which has led to vandalism, and in turn a security risk to near-by residents etc. is unacceptable. One would hope that the owners would act in a more responsible fashion rather than showing complete disregard for the community situated in close proximity to the site. As a Rhodes history graduate I am horrified that the station is being degraded in this way. TRANSNET, MAKANA MUNICIPALITY, EASTERN CAPE PROVINCIAL LEGISLATURE, SAHRA, and the NATIONAL LEGISLATURE must act now before this piece of our heritage is beyond restoration. How many people living both in Grahamstown and all over the world first arrived in this historic town by rail? Be remembered for more than a fossil record of trash! Directors of Transnet to take responsibility in terms of their positions! During my stay in Grahamstown I loved the historic feel of the town. I think sites like the railway station and the Old Gaol should be preserved for both residents and tourists. How is it possible for a supposedly responsible SOE (Transnet) to allow its property to fall into such a state of disrepair? The fact that the railway between Alicedale and Grahamstown is closed is no excuse! I grew up in the eastern cape. I have communication i have emailed in the last 6 motnhs to heads of transnet and departments about the station requesting assitance, to no avail - i would love to get involved and help/petition - whatever it takes. I sign on behalf of the Heritage Railway Association of Southern Africa (HRASA) - the umbrella body for the steam and heritage sector in Southern Africa. I think that it's an absolute disgrace that this building has been allowed to deteriorate it's current condition. I went to college in Grahamstown in the 1950's and have very fond memories of the station. I'd love to see trains running again. I've always appreciated the station architecturally, historically and as a gathering site and lately as a performance venue. It is shameful that this invaluable asset to the entire community has been neglected to the point of deterioration and vandalism. Its renewal will be meaningful to the present. It has to be saved! It is about time our Heritage buildings were preserved. It is vital to save it. There must be a way to secure the property and use it in a way to benefit Grahamstown. Many of my students would use the train, and so would I. It would bring more people to Grahasmtown as toursists too. So it helps the locals, by providing alternative transport, and by creating jobs through tourism. Please bring back our train!! Please include the Old Gaol as well. Thank you for taking the initiative. Please save our station - we used to have the railway line behind our home in Francis Street - so many wonderful memories of waving to our school mates as they left for holiday!. This is a historical monument - please save this! Please save this historical building. Preserving out heritage of whatever nature preserves our history and is not negotiable. Something has got to be done. This was a special place a long time ago but more recently it was also used by non profit organisations as their offices. The appropriate people are not at all looking after Grahamstown's historical buildings. They are all going too rack and ruin. This beautiful old station is a national asset and worthy of safeguarding for future use. It is against the letter and spirit of the regulations to just allow it to be plundered. The fact that is owned by an SOE which is permitting this devastation is cause for greater concern as any state or state owned institution should be setting a good example in these matters. It could surely be rented out for business use and produce income but the SOE does not seem to care about that either. This is a dreadful shame on Grahamstown to allow this heritage building to be vandalised. This is atrocious what is happening. We need to stand together and do what is right. Let us not destroy the history of our country !!! This is definitely worth preserving and restoring. Could provide a rich and lucrative tourist offering. This magnificent entity is now a disgrace to Grahamstown. The municipality should stop hiding away and step forward. Nearly 200 years of history..... left to rot!!! Transnet and affiliates have been dereclict in their duty in maintaining the railway infrastructure in this country. The fate of this magnificent old station is a symptom of a nation wide problem. As fuel prices rise there may be a good chance that rail will once more come into its own again and Transnet will rue the day they did not perform routine maintainance and monitoring instead of facing the massive expense of starting from scratch. The fact that they could not care about their own heritage sites is also shocking. If they could not care less, why did they agree to the declaration? Very disheartened by the state of the railway station as it is now. We need to save this beautiful building before it falls down!!! What a shame that Transnet is neglecting its assets like this! The decline of this beautiful old building has economic implications for the city - and already we see impacts on tourism and business. Many, many times before, there have been efforts to establish the old railway station as a terminus for the various long distance bus services which come to Grahamstown, but this has never come to be, due to lack of vision or good leadership. If such an initiative were facilitated, the building could serve as a safe and hospitable waiting point for travellers, and enable the creation of economic opportunities for local entrepreneurs (e.g. internet cafe, sale of tea/coffee, snacks, newspapers, etc etc). Saving the station is the RIGHT THING TO DO. Until recently, we lived in Grahamstown for over 21 years and feel strongly that any building that adds to the great architectural heritage is worthy of preservation. The railway station is a beautiful building that, if restored, could be put to good use. Grahamstown is a magical and beautiful place. The restoration of the station is really important and invaluable to its people. This historic station needs to be saved. This could become a character hotel, craft centre (to support local industry) or creative hub for tourists. Think, Transnet, think! I went to Rhodes and love Grahamstown and it holds a special place, I think it could be an amazing opportunity for the town! With fuel shortages, one day we might need this station. Solar trains hopefully. The neglect of the station is a disgrace. Makana Municipality and Transnet should be ashamed. As an artist who visits Grahamstown each year (sometimes more than once) for both work and pleasure, I would FAR prefer to get the train than drive or fly. Reinstate the railway line and the station. We will use it I promise! This could be restored so beautifully and become both educational and a tourist attraction. Don't let vandals destroy our history!! Heritage is a vital part of who we are. Once heritage is lost it can never be recovered. I have fond memories as a kid going by train from Krugersdorp to Grahamstown to visit my grandparents. Surely if the building is being stripped and vandalised the police should be involved in prevention and prosecution? That is part of the problem: Transnet do not show up to support any criminal charges and the police claim they cannot act if the owners are not prepared to appear in court. Heritage sites should be maintained and remain open to the public. Authorities should be brought to book for allowing this to happen, not just Transnet, but Makana municipality and the Police. Charges should be laid. Another suggestion is to turn the area into a crafters centre, veggie market and such like, as they did in Mossel Bay. Regular use of space (and onsite security) will prevent vandalism and vagrants loitering around unchecked. Please save this important heritage site which if utilized creatively could create employment in Grahamstown. It would be wonderful to save our heritage and see our trains running again. A lot of Old Stations are used as Restaurants in Kzn. 1. This Act binds the State. This legislation aims to promote good management of the national estate, and to enable and encourage communities to nurture and conserve their legacy so that it may be bequeathed to future generations. Our heritage is unique and precious and it cannot be renewed. It helps us to define our cultural identity and therefore lies at the heart of our spiritual well-being and has the power to build our nation. It has the potential to affirm our diverse cultures, and in so doing shape our national character. Our heritage celebrates our achievements and contributes to redressing past inequities. It educates, it deepens our understanding of society and encourages us to empathise with the experience of others. It facilitates healing and material and symbolic restitution and it promotes new and previously neglected research into our rich oral traditions and customs. Disgrace that a valuable building which could be an asset to Grahamstown as an attraction for tourists is left to rot and for thieves to steal a building piece by piece and the powers that be do nothing about it. I grew up in Grahamstown and have such special memories. It's so sad to see how many parts have been neglected. I hope that it can be restored to its lovely nature that it had many years ago. We need to preserve our heritage for the good of all South Africans. The train line from Alicedale through Grahamstown down to Port Alfred should be promoted as a tourist must do. Team up with B&Bs and hotels and other accommodation in Port Alfred to give a package deal. Proud 1820 Settler descendent and horrified that important historical sites are being neglected. This situation is a disgrace. The station, the old gaol, Grahamstown genrerally. This should never had happened - we need to value and treasure this piece of history - so sad!! Restoring it for a useful purpose would be fantastic! Born and raised in Grahamstown. Rail transport to and from Grahamstown would be fantastic for the area. It could not only be utilized by students and folk connected with all the schools and the university in the area, but also for the Arts festival goers, and tourists in general. Special tours could be arranged highlighting our Settler heritage, and this could have a knock on effect for b&b's etc, bringing much needed revenue and employment to the area. Saving these old buildings too, is so important, tourists also love to visit such places, and possibly a steam train trip could be part of the whole idea to inject life and employment into the area. Allowing the old train station to fall into disrepair is a major security risk not only for people who live in the surrounding area but also for people who use the pathway back to the township from there. There have been a number of reports of people being robbed by violent thugs who have taken to hanging out by the old train station. Aside from the security risks that arise from the current situation, the old train station is a part of Grahamstown's history and should be preserved as a monument of sorts for the benefit of tourists and locals alike. Was born in Grahamstown. Lived and worked there many years. Children went to school there. Used the train station on average once a year while there. Very sad to see it in such sad state. Hope it can be fully restored or at very least, buildings used for community. I would love to see the train station be operational again, with everyone that has so much transport problems I don't see why not? What about using it to transport goods is petrol not so expensive that this will be a valid option to transport? As old residents of Grahamstown we would hate to see this historical station being pulled down. Can’t believe this has been allowed to deteriorate to this extent. I was born and raised in GT and used to sometimes travel to Port Alfred from this station. I grew up in Grahamstown and met many a family member at that station - my favourite aunt being a regular. How sad that our new government can neglect to maintain and care for our national heritage. Yes, I blame them since municipalities are part of them and Transnet is a parastatal. The ANC government and municipalities have no respect for anything other than what they can benefit from personally – Nkandla being the best example of all. This is an irreplaceable piece of rare architectural history and significance which cannot be allowed to just disappear !!!! As someone who grew up in Grahamstown I think this is an important isisue. It is a disgrace that such a beautiful building and part of our history should be allowed to fall into disrepair like this. In my opinion this is exactly what our country is heading for – destroyed, neglected and not cared for. Please don’t let such a wonderful and historical building go to such waste! Turn it a pre-school, community hall or something! We lived in Grahamstown for almost 30 years. My husband was born there. Tourism is almost all it has and historical buildings should be preserved. The station building would make a more sensible bus stop. It is heartbreaking to see the beautiful old station in such a state. It should be restored and turned into a tourist attraction, please would the authorities do something about it before it is too late. A priceless treasure. To lose it will be to declare to the world that Grahamstown has no pride and people should not bother to stop there or to visit. Destroy the heritage buildings and you destroy the Soul of a Town. I hope that this campaign will not only awaken Transnet to the importance of restoring and securing the historic station building, but that it will also be the beginning of an effort to restore rail services to the Makana area. Living in Europe at the moment, I see on a daily basis the huge benefits of having a functional passenger railway, particularly the environmental and safety benefits of train transport and the efficiency of the system to commuters and long-distance travellers. One of the arguments against rapid deployment of renewable energy is cost. Renewable technologies over time become cheaper as R&D improves; fossil fuels on the other hand become more expensive as they deplete. Eventually we will reach a point when fossil fuels will become too expensive and at that point, so the argument goes, the market will fix the problem. The difficulty with that argument is that the longer we wait, the more installed infrastructure there is to replace. What we have seen with oil is that, aside from times when there have been short-term price shocks, the inflation-corrected price of oil up to 2006 remained around $30 per barrel. Then in 2007, the price rapidly took off and headed to about $150, before a worldwide economic crisis slowed the world economy. Even so, the price has persistently stayed at 3-4 times the long-term level. Why? Because conventional oil output was heading to a peak, meaning we were increasingly relying on more expensive resources that previously were not viable. What that illustrates is that when supply becomes constrained, price can rapidly exceed the levels where alternatives become viable, meaning the price signal favouring alternatives kicks in a lot faster than those alternatives can be rolled out. Had the financial sector not collapsed in 2007, the rapid increase in oil prices would have triggered a downturn. Take a look at these three scenarios in which energy use increases by 2.5% per year (close to the long-term average), doubling roughly every 30 years. 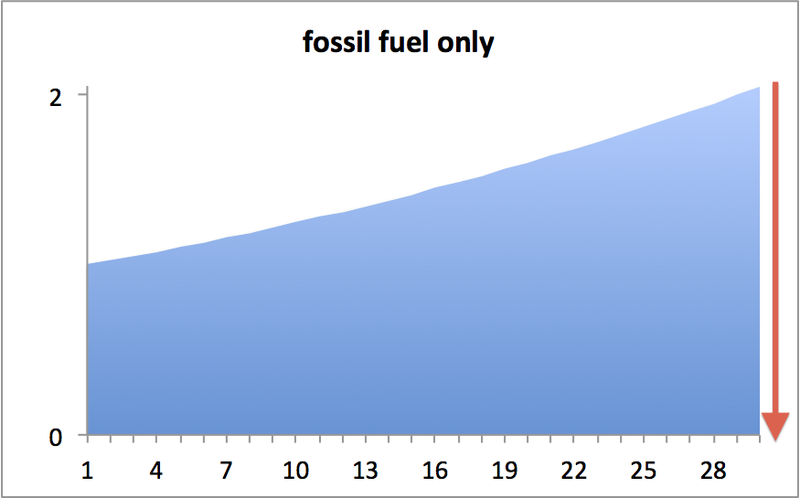 In the first scenario, we have only fossil fuels contributing to that doubling. That means after 30 years, we have twice as much fossil fuel infrastructure to replace as we had at the start. If prices of fossil fuels only increase rapidly once supply fails to keep up with demand, we have an enormous amount of infrastructure to replace very quickly. The red arrow illustrates the amount of energy production that must be replaced. What if we have a cautious approach and aim to increase renewables by 1.5% of total energy demand per year, i.e., not as much as demand increases? Then we have the second scenario (bottom left panel). 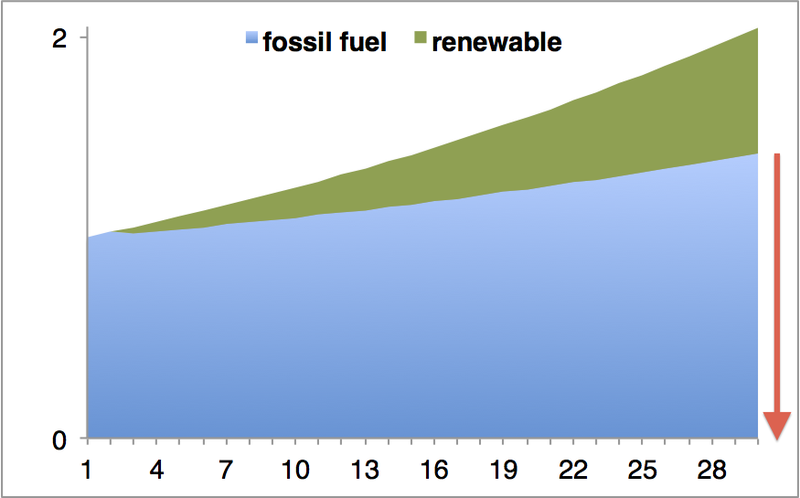 In this scenario, when we have to replace fossil fuel infrastructure, the total amount is still large – about 70% of the amount in the no renewables scenario. 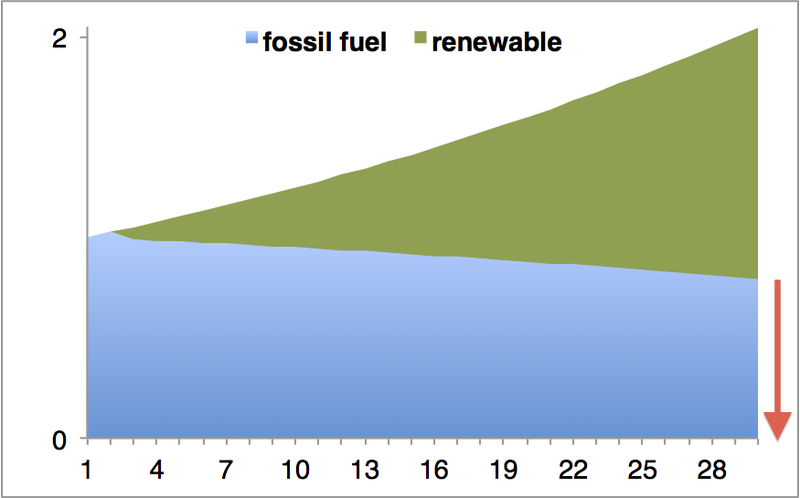 If we try harder and aim to increase renewables by 3% of total energy use every year, i.e., more than the increase in demand, we get the final scenario. In this version, after 30 years, the red arrow represents less than 40% of the infrastructure that would have to be replaced in the first scenario. How soon do we need to worry about this? Don’t we have 200 years worth of fossil fuel reserves? Leave aside the issue of climate change that says we shouldn’t actually burn all this stuff. At a rate of increase of 2.5% per year, 200 years of use results in a little over 70 years before it’s all gone. And in practice, long before we get there, the high quality resources will be depleted. If we do not want a real monster of an economic crash when all cheap fossil fuel reserves run out and we don’t have time to replace all that outdated infrastructure, we should aim for a faster deployment scenario in which new clean energy increases faster than total demand. As I illustrate here, that faster increase need not be dramatic if we start early enough. Wait too long, and we start running into scenarios where we have to replace a lot of infrastructure at once – and that can only be expensive. Two recent articles at RealClimate by Gavin Schmidt and Mike Mann discuss the issue of scientific advocacy. Back in apartheid South Africa, academic advocacy was controversial. There were those who argued science was value-free and hence above political concerns. Others argued that science may be value-free but scientists aren’t – you can choose the problem you work on, and can avoid those that may do harm. We had another instance of this in the tobacco and HIV wars. The denial camp used every trick in the book to confuse the public, and scientists who weighed in were often accused of venturing into politics, as if the other side had not. And in any case, why should scientist not employ their well-informed views to public debate? Does anyone object if a lawyer uses their legal knowledge to articulate a policy position, or an accountant, or any other professional? Must a political scientist confine their critique to theoretical or historical political systems, rather than the world today? Why do scientists need to be apologetic about informed advocacy, when advocacy is a core value of those opposing the mainstream – to the extent that their advocacy will embrace any argument even when they contradict themselves? Somehow, being an advocate when you are almost certainly right is unacceptable whereas being an advocate when you are almost certainly wrong is just fine. People like Richard Lindzen (MIT, climate science contrarian) are no strangers to the op-ed pages, and the people who took Mike Mann on in the faux hockey stick controversy did not restrict their commentary to scientific publication – subjecting someone to multiple levels of inquisition including a congressional investigation went way beyond standard scientific etiquette. The gloves have been off for a long time, and the people who threw the Queensberry rules out of the window are on the anti-science side. It’s time we started saying this loud and clear, and stopped letting them get away with the myth that the mainstream has somehow perverted science to a political and rather doubtfully-constructed economic agenda, when it is clearly the case that the denial camp is guilty of all the above (except the economic case for denial is crystal clear). Finally, there is the question of fake balance – the notion many news media have that you have to give equal time to both points of view. This is not consistently applied – the “balance” usually happens if both sides have similar clout, or the one that is left out complains loudly enough. When, for example, is the TV news market report followed by a Trotskyist rebuttal? You may argue that Trotskyism is not a valid economic model, but then you are making a judgment about the “other side”. If the “other side” has no plausibility, why give them equal time? Or as Isaac Asimov succinctly put it, the denial argument is “my ignorance is just as good as your knowledge”. So why do arguments with scant evidence such as tobacco isn’t that harmful, HIV doesn’t cause AIDS and climate change isn’t happening rate “equal time”? Usually this happens when the people pushing the denial agenda have significant clout – political or economic. In the case of AIDS denial, a case that was largely being ignored because it had no serious evidence to back it was pushed to the forefront when former South African president Thabo Mbkei embraced the denial argument because it suited his politics, which denied that African people could have any special susceptibility to disease other than colonially-imposed social causes. With tobacco and climate change, economically powerful businesses are threatened by the science, so they defend themselves with obfuscation, aiming to delay policy changes negative to their continued profitability, and damn the consequences. With tobacco, this eventually caught up with them when they lost major lawsuits and were forced to publish documents revealing the extent to which they supported scientific fraud and in general a campaign of confusion. It should be no surprise to anyone who has witnessed the pro-tobaccco and anti-climate science campaigns that they are not only similar in style but have common roots. So what are scientists to do in the face of a concerted denial campaign? Withdraw to the lab and allow something harmful to continue? Aside from the obvious ethical issue with doing so, I can guarantee that once the evidence of harm becomes impossible to ignore, scientists who were in the know will be blamed. So no, keeping quiet is not an option. So what is? I had the now sadly not to be repeated pleasure of watching late Stanford professor Stephen Schneider talking to a skeptical audience in Australia. He did not get emotional. He did not insult them. He patiently explained why each point they were making did not fit the evidence. This is a model for how scientists can operate. It does not mean we cannot go into politics, or orgue for particular policy settings. But it does require discipline in talking about the science.